In Simple words Quorum is an Ethereum-based distributed ledger protocol that supports transaction and contract privacy. The primary features of Quorum. Apart from these feature Quorum includes one of the powerful feature that is support of Private and Public Transactions. Private Transaction :- are those Transactions whose payload is only visible to the network participants whose public keys are specified in the privateFor parameter of the Transaction . privatefor can take multiple addresses in a comma separated list. Public Transaction :- These are those Transactions whose payload is visible to all participants of the same Quorum network. These are created as standard Ethereum Transactions in the usual way. The treatment of both type of transaction is different for Public Transaction it is sent to an Account that holds Contract code, each participant will execute the same code and their underlying StateDBs will be updated accordingly. But For Private Transaction it replaces the original Transaction Payload with a hash of the encrypted Payload that it receives from Constellation. Participants that are party to the Transaction will be able to replace the hash with the actual payload via their Constellation instance, whilst those Participants that are not party will only see the hash. Now let see how Quorum works Internally. A’s Quorum Node passes the Transaction on to its paired Transaction Manager, [Transaction Manager A] requesting for it to store the Transaction payload. A’s Transaction Manager makes a call to its associated Enclave to validate the sender and encrypt the payload. A’s Enclave checks the private key for Party A and, once validated, performs the Transaction conversion. 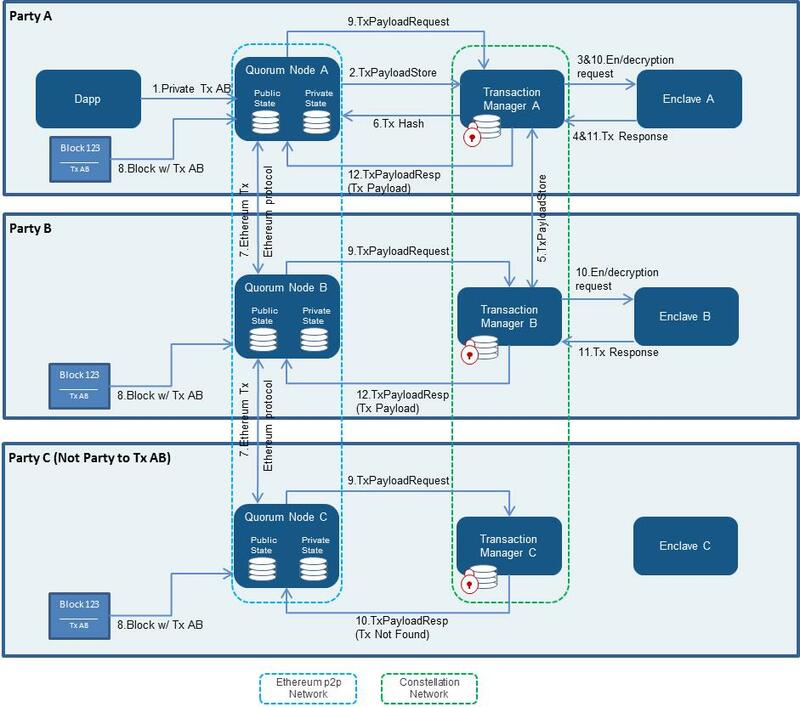 Party A’s Transaction manager then stores the encrypted payload and encrypted symmetric key and then securely transfers (via HTTPS) the hash, encrypted payload, and encrypted symmetric key that has been encrypted with Party B’s public key to Party B’s Transaction Manager. Party B’s Transaction Manager responds with an Ack/Nack response. A’s Transaction Manager returns the hash to the Quorum Node which then replaces the Transaction’s original payload with that hash. In Seventh Step Transaction is propagated to the rest of the network using the standard Ethereum P2P Protocol. A block containing Transaction AB is created and distributed to each Party on the network. In this step all Parties will attempt to process the Transaction. In this step A and B make a call to its Enclave, passing in the Encrypted Payload, Encrypted symmetric key and Signature. But C will receive NotARecipient message. The Transaction Managers for Parties A and B then send the decrypted payload to the EVM for contract code execution. This execution will update the state in the Quorum Node’s Private StateDB only.